The perfect getaway to do as little or as much as you want. 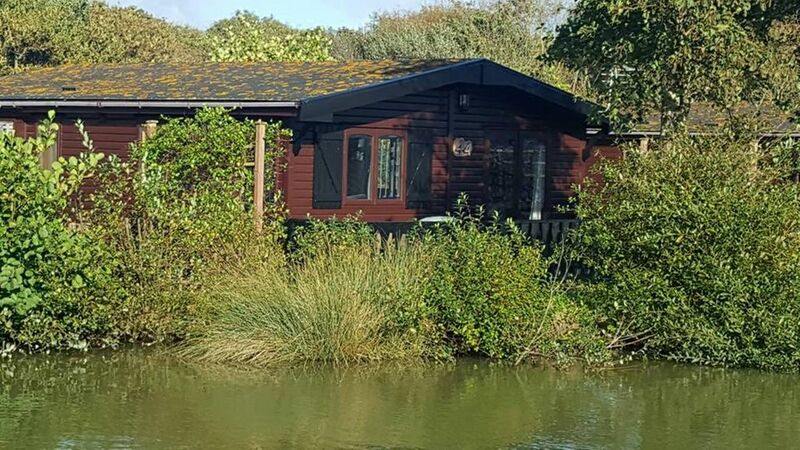 The Lodge By The Lake is a charming 2 bedroom, timber lodge situated on, arguably, the best pitch on the park, right by the fishing lake in the tranquil area known as Amberwood, at the 5* rated Shorefield Holiday Park near Milford-on-Sea, Hampshire. The Lodge By The Lake is one of only three lodges situated right on the fishing lake and the ONLY lodge rented out to holidaymakers. If fishing's your thing, this is the place for you! If fishing is not for you, just admire the view and soak up the tranquility! The spacious main bedroom has a king size bed, 2 bedside cupboards, a large wardrobe and vanity unit. The twin room has 2 full size single beds, separated by one bedside cupboard. There is also ample storage space in the wardrobe. Additionally, there is a collapsible cot-bed for babies/toddlers. The bathroom has a shower over the bath, toilet, wash basin, storage cupboard and heated towel rail. The open plan lounge/dining area is very light and spacious with 2 sofas, a round dining table with 4 chairs, 36” flat screen Smart TV with Freeview and separate DVD player. There is a selection of family DVDs in the lodge and more can be rented from the on-site shop. The kitchen has everything you need to self-cater, including a fridge, freezer, gas oven and hob, microwave, oven, toaster and kettle as well as cutlery, crockery and utensils. There is an on-site laundromat. The spacious deck has a comfortable sofa and 2 chairs as well as an outdoor dining table, 4 chairs and umbrella. The deck looks out over the tranquil fishing lake, just 10 ft away. If fishing is your thing, then this is the perfect spot for you! There are several fishing stages around the lake for other people but you will benefit by being able to plot up with your rod, right in front of the lodge (standard rod licence required). Further, the whole park benefits from free WiFi. The signal in and around the lodge is excellent. There really is nothing better than relaxing on the deck in the sun with a glass of Prosecco, watching fish jump out of the water, gazed at by herons as still as statues... There is parking for 2 cars right outside and it is a leisurely 10 minute stroll to the entertainment complex. Shorefield Country Park itself is a fabulous 5 star rated holiday park set in 100 acres of delightful landscaped parkland. It's a perfect location positioned between the stunning New Forest, with its free-roaming ponies, donkeys and cows, and some fabulous beaches. The park is close to the beach at Milford on Sea (10 minute walk from the lodge) and just a couple of miles from the heart of the New Forest National Park. Attractions nearby include Highcliffe Castle, Mudeford Quay, Beaulieu Motor Museum, Hurst Castle and the towns of Lymington, Christchurch and Bournemouth, with its famous sandy beaches, piers and attractions. Just a short drive away, a fantastic, quiet, sandy beach awaits you at Barton-on-Sea or a little further on, Avon Beach, with full facilities as well as the marvellous “Noisy Lobster” beach restaurant. Just a 10 minute stroll from our lodge, out the back entrance of the park, you will be on the cliff at Milford-on-Sea where you can gaze across the water to the Isle of Wight and the Needles giving an impressive backdrop to any day on the beach. If you’re staying for a few days, a day trip to the Isle of Wight from nearby Lymington is well worth it. Shorefields park has great entertainment for all ages. Cyril and Cybil, the resident squirrels, and their new friend Pat the Pony, provide endless joy for the younger holidaymakers with kids entertainment every evening during holidays and at weekends throughout the year in the Showbar. For adults, there is a separate over 18s only bar/lounge and evening entertainment. There are also both childrens and adults games arcades. For the more active, there is a superb indoor pool with beach area for young children, poolside sauna, steam room and Jacuzzi. A full range of treatments are available in the day spa and, for the more energetic, there is a fully equipped gym and classes to join in. Outside, there is a tennis court and a fantastic outdoor swimming pool (May half term to September). There is a new large outdoor childrens play area next to the open air pool. For those who enjoy walking, the “woodland walk” leads you from the park to the nearby village of Milford-on-Sea and there is a fun nature walk for the kids to follow. The on-site shop provides a wide range of goods including groceries, newspapers, beers, wines, spirits and tobacco, as well as toys, games, swimwear, gifts and lottery tickets. There is also a large Tesco nearby and more shops in New Milton, a 5 minute drive from the park. If you don’t fancy cooking for yourself, you can dine in Tides bar and restaurant, which provides a varied menu and separate kids menu. There is also Michaelangelos take-away pizza. If you prefer to dine out, I can thoroughly recommend The Beach House at Milford on Sea (1.5 mile walk along the cliff top walkway from the lodge) - a Hall & Woodhouse pub set in a stunning Victorian building with a lovely garden overlooking the sea and The Needles of the Isle of Wight beyond. The food is reasonably priced and the menu varied. I've never had a bad meal there. Further afield is the amazing Noisy Lobster restaurant, set right on the beach at Avon Beach (10 min drive). Specialising in sea food, this place always gets it right. Fabulous atmosphere, reasonably priced, great service, wonderful food - don't go home without trying it but you MUST book! If you are keen on fishing and have the necessary rod licence, there are fishing stages on the other side of the lake for others and you can fish from right in front of the lodge. Leisure passes are required to use the facilities within the main building (Showbar, arcades, swimming pools and gym). Please note, the price of the lodge does not include leisure passes. These can be purchased on arrival from reception and are very reasonably priced (just £52.90 for a family of 4 for 7 days in high season). Situated on the southern edge of the New Forest, Shorefields Park really is the ideal location to base yourself to explore this beautiful part of Hampshire and Dorset. Equally, there is plenty to do within the park, so there is no need to leave at all! It’s up to you. Bed linens are provided and the beds will be made up for your arrival. Please note the lodge does not come with towels. You will need to bring your own bath, tea and swimming towels. In my lodge, you will find personal touches that you would not find in a Shorefield owned lodge such as a better TV and a range of DVDs and books. My lodge should always be better value to rent than a Shorefield lodge and you have the added advantage of knowing exactly where it is on the park - one of the best spots - honestly! My husband and I run a pub/B&B/wedding barn called The Square & Compass at Ashill in Somerset. We have a 8 year old daughter. We pop down to Shorefields regularly and it really feels like a holiday every time. The Lodge By The Lake is our seaside/forest bolthole. We visited Shorefields a couple of times with our young daughter and really liked the park, its facilities, the lodges and the area. Buying this lodge was a no-brainer. When you visit this lodge, you will see why we fell in love with it. It is one of just three lodges occupying a lakeside position and the only one rented out. It is warm and cozy in the winter months but truly comes into its own in the spring and summer where you can easily lose yourself in thought on the sunny deck. There is so much to do here if you want an active holiday. Equally, it's perfect if you just want to relax, read a book or gaze out over the lake. The choice is yours. The Lodge By The Lake is one of just 3 lodges which sit right by the tranquil fishing lake. It is, arguably, the best spot on the park but of course, that's a matter of opinion. There is very little traffic in this quiet corner of the park. A pedestrian exit just a few minutes walk from the lodge leads you to the coast road and there are wonderful clifftop and beach walks towards Barton-On-Sea one way and Milford-On-Sea the other. I always take a long walk when I'm here. Shower over bath. Window. Toilet. Heated towel rail. Please note you need to supply your own bath and swimming towels. There are electric wall heaters in the lodge as well as an electric heated towel rail in the bathroom. There is a fan heater in the lounge which is also a bluetooth speaker. Yes. The lodge beds will be made up for you. Please bring your own bath, swimming and tea towels. There is no washing machine in the lodge but there is a laundromat on site by the reception area. There is no tumble dryer on site but there is a laundromat on site by the reception area. There is a wall mounted electric heater in the fireplace. It is also a bluetooth speaker to which you can connect your phone, Ipod etc for music. There are two private parking spaces right outside the lodge. Free guest WiFi is available in the lodge and throughout the park. There is a well equipped on-site gym with exercise classes, a day spa as well as indoor and outdoor pools, jacuzzi, steam room and sauna. Fridge - please take all your perishable food with you or dispose of it in the park bins. You are welcome to use any dried goods (herbs, spices, cooking oil etc) in the cupboard and leave any non-perishable items behind for the next guest, if you so wish. The electric wall heater in the lounge also doubles as a bluetooth speaker to which you can pair your phone/Ipod etc. There is a DVD player with a selection of family DVDs in the lodge. There are some books to read. Feel free to swap books but please don't leave anything inappropriate!! There is a pool table, air hockey and numerous kids games machines in the arcade. There is a separate adult arcade. There are childrens games and puzzles in the side-board in the lounge. Pool table in the arcade. There are kids puzzles and games in the sideboard in the lounge as well as Swingball in the lounge cupboard. DVDs are available to rent from the onsite shop. SUP and kayaking lessons are available at nearby Milford on Sea. There is a tennis court on site, bookable at reception. There are so many attractions near the lodge to suit all ages... the most obvious being the beautiful New Forest with acres and acres to explore on foot, by car or bike. Peppa Pig World, Highcliffe Castle, Avon Beach, Barton-on-Sea beach, Lymington Saturday market, day trips to the Isle of Wight to name just a few, plus the wide range of activities at Shorefields park itself. Homely, with added extra to entertain the kids (dvd’s, board games, puzzles). Nice quite location with good facilities walking distance (beach, swimming pool, tennis court). The owner was very helpful, providing us with valuable and detailed information before and during the stay. This ensured we arrived with everything we needed that wasn't provided in The Lodge. The lodge is beautiful; well furnished and very comfortable. A short walk 5-10 mins from the resort reception/swimming pool/shop etc and around 10-15 mins walk from the seafront. The Lodge was a home from home where we had a truly lovely few days. To wake up to the view every day was fabulous, and so quiet and peaceful. My partner fished in the lake every day for an hour or two and was even out there at 5.30 one morning!! The fish were always very active and were lovely to hear and watch whilst chilling on the veranda. Exactly the relaxing break we needed, and a place we will come back to again. Thank you Kate. Sweet and natural lodge with charming setting and all the amenities a hotel weary guest requires. daytime and evening entertainment, adult entertainment, adults only bar, family bar and restaurant, takeaway, day spa with full range of treatments, on site country store with bakery, lottery, wines etc. - sandy, Highcliffe - shingley, Avon - sandy, Mudeford - pebbley), crabbing at Mudeford Quay, 5 min ferry trip from Mudeford to Hengistbury Head (fantastic Beach House restaurant amazing beach), The Noisy Lobster beachside restaurant - Avon Beach, the charming town of Lymington with its harbour offering a range of boat trips. A little further afield is, of course, the incredible New Forest with its 219 square miles of forest and heathland, home to hundreds of free-roaming ponies, donkeys, cows and wild boar. Perfect for cycling or walking and picnics. Also home to great days out at Beaulieu Motor Museum, Longdown Activity Farm and, my favourite, The New Forest Wildlife Park and many more. I accept 3 or 4 night mid-week breaks starting on Mondays, 3 night week-end breaks starting on Fridays and 7 night breaks starting on Mondays or Fridays. If you would like to stay for a different number of days, depending on bookings, I will be as flexible as possible. If you are interested in a longer-term booking, please contact me for rates. Check-in is 3pm. Check-out is 10am.